The visor is just one example of Jo's work. 1. Read through instructions completely before beginning pattern. 2. I used a narrow tape measure to mark the places for the holes. I placed them about 1/4 inch from the upper edge of the visor. See the photo. 3. 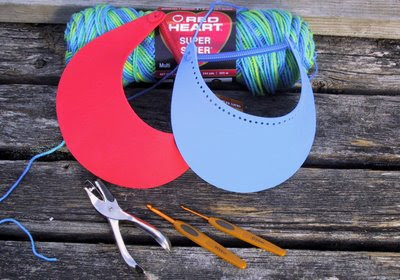 When using the C hook, pull your stitches up slightly, you need to be able to get your H hook through them on the next round. 4. Always pull your slipstitches tight, you want them to nearly disappear. 5. To work dc dec, *yo, insert hook in st, yo, draw loop through, yo, draw through 2 loops on hook, repeat from * in next st, yo and draw through 3 loops on hook. 6. To work sc dec, Insert hook in next st, draw up a lp, (two loops on hook), insert hook in next st, draw up a loop (3 loops on hook), yo and draw through all 3 loops. 7. 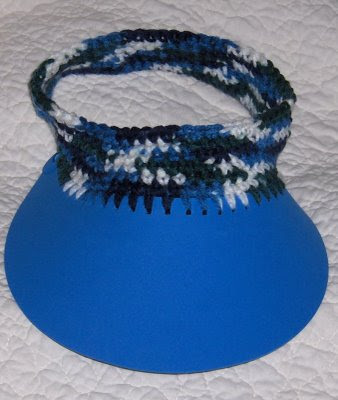 Cap/visor may be worn with or without the coil in place. 8. Cap will look funky until it is on, but you will be stylin’. Remove coil from visor. Save the coil so you can put it back. Punch 27 holes evenly spaced between the 2 holes where the coil was. That is one hole about every 3/8 inch. Try it on at this point. It should fit snugly. If it is doesn’t fit, adjust by making fewer or more chains. For visor fasten off now. To make a cap, continue with following rounds. At this point it should measure about 3 inches at the back. Fasten off, either leave hole at center top of cap open or weave end through the last 9 sts and pull tight. Weave in ends. Oh no! Another wonderful pattern! I can't stop making the Lotsa Beads hats and now I am "hooked" on these visor caps! You are just awesome!!! Thank you for the wonderful patterns and helping my addiction to crochet! Crochet Hugs! I love this hat pattern. I went out and bought a visor just to make it. I was wondering if it could be made with worsted weight cotton yarn. Such as Peaches and Cream. I sweat the most on top and back of my head due to meds that I'm on. Thank-you again for such great patterns. I think it will be fine in the Peaches and Creme. I have the supplies to try that, but just haven't gotten around to it. I love this! Where do you find the foam visors? I'd love to get some and make some of these. Visors are available at Wal-Mart, JoAnn Fabric and Craft, Michaels and probably other craft stores. Regular price is about $1, they are often on sale for around 70 cents. Thank you! I just did some searching online, and I'm going to go to Hobby Lobby tomorrow and see if I can find the visors there. Can't wait now to try your pattern! Lady, you are WAY TOO TALENTED!!!! Love your patterns!!!!!!!!! 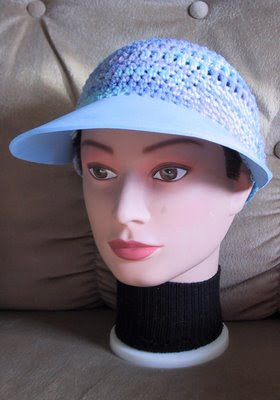 I just got these visors to try to crochet myself! Then I am clicking and find this Fantastic site! Dollar General has these for a package of 3!